What is a delegate? How and when do I use them? ELI5 = Explain Like I'm Five . How does delegate work? Why does tableView(_ tableView: UITableView, didSelectRowAt indexPath: IndexPath) in view controller gets called automatically when I tap a row? Explanation about UITableViewDelegate? is located at the bottom of this post. The delegate variable is defined as weak to prevent retain cycle, explaining retain cycle can be a whole post itself so we will skip it for now and leave it for another post. Assume the tapped(at point:CGPoint) method will be called whenever a tap is received on the tableview. The tapped(at point:CGPoint) method will calculate which row is located at the tapped coordinate and notify its delegate. Remember in the view controller, we set the table view delegate to the view controller itself? So when the delegate?.tableView? (_ tableView: self, didSelectRowAt indexPath: indexPath) is called, it is equivalent to calling ViewController.tableView? (_ tableView: self, didSelectRowAt indexPath: indexPath). This is why the tableView? (_ tableView: self, didSelectRowAt indexPath: indexPath) method in your view controller is called when a row in the tableview is tapped. This is the delegation design pattern you often see in iOS Development / Apple's code. There are two question mark ? in the delegate?.tableView? (_ tableView: self, didSelectRowAt indexPath: indexPath). We will explain them one by one below. This is also the reason why delegate methods (eg: didSelectRowAt) won't get called if you forgot to set tableView.delegate = self. // if it is implemented. Heck, there are dozens of UITableView delegate methods, imagine your app crashes because you didn't implement all of them in view controllers 😱. You might notice that all of the UITableViewDelegate methods always starts with func tableView(_ tableView: UITableView , why include the tableView object itself in the delegate method? This is to let the delegate (eg. view controller) know which tableview has called this function. Since both tableView1 and tableView2 calls the same delegate method, how do you know which tableView called it? This is where the tableView parameter in the delegate method comes in. // how do I perform different action for different tableview? Generally most delegate methods follow this pattern (passing itself as the first parameter of the method) to let user know which object initiated the delegate calls. When do I use delegate? Most of the UIKit classes like UITableView, UICollectionView, UIPickerView etc has delegate methods you can use. These methods provide convenience for us as we won't need to manually write code to detect which cell is selected etc. Some non UIKit class like SKProductsRequest also utilize delegation pattern, it will call its delegate when in-app products info is retrieved from App Store. When would I write a custom delegate? Usually when I want to pass some data from a view controller back to its previous view controller, I will implement a delegate and protocol for the view controller, like this. You can also write delegate methods for your own custom UIView class so that it will notify the delegate when certain action is performed. UITableViewDelegate in weak var delegate: UITableViewDelegate? is not an object type / class, it is a protocol. Meaning you can put any type of object as the delegate as long as the object's class conform to the protocol. In simplified terms, protocol contain a list of required methods and optional methods , if a class wants to conform to a protocol, the class have to implement all of the required methods listed in the protocol. This is because the ViewController haven't implement the required methods listed in the UITableViewDataSource protocol yet. optional func tableView(_ tableView: UITableView, titleForHeaderInSection section: Int) -> String? 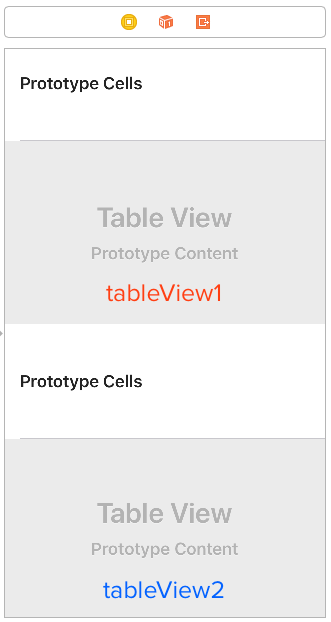 optional func tableView(_ tableView: UITableView, titleForFooterInSection section: Int) -> String? After implementing these two methods, Xcode will stop complaining as the view controller has conformed to the UITableViewDataSource protocol. optional public func tableView(_ tableView: UITableView, willSelectRowAt indexPath: IndexPath) -> IndexPath? optional public func tableView(_ tableView: UITableView, willDeselectRowAt indexPath: IndexPath) -> IndexPath? 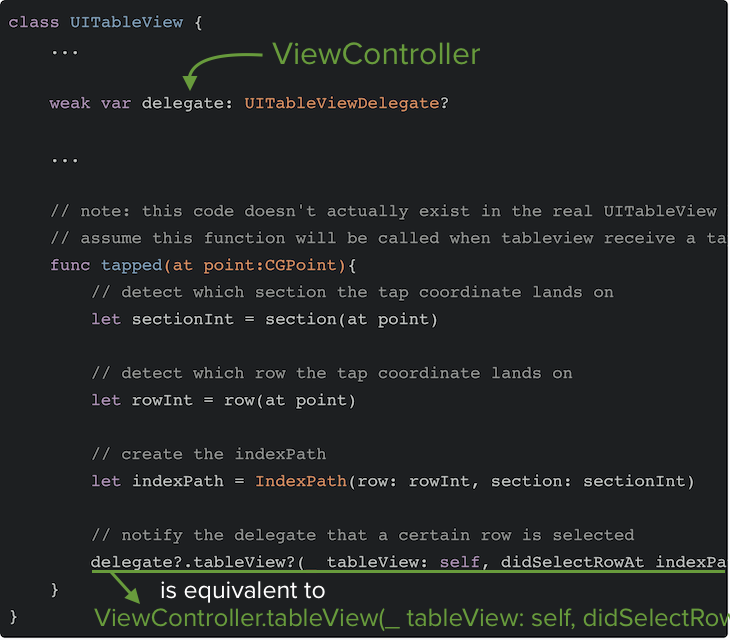 Since all methods in UITableViewDelegate are optional (no required methods to implement), all you have to do is include 'UITableViewDelegate' in the class declaration of View Controller to make it conform to UITableViewDelegate. Phew, that was easier than expected. Usually, Delegate protocol only contain optional methods as programmer normally won't need to use all of the method listed in the delegate protocol.